Rock Island Confederate Cemetery is the only surviving remnant of a massive prison camp that once held thousands of Confederate soldiers. 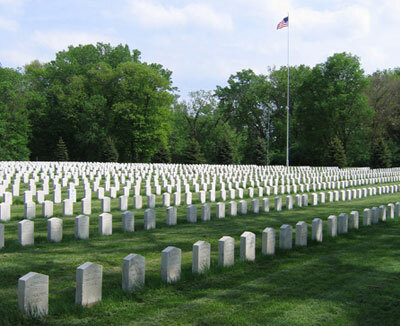 Located near the southeast corner of Arsenal Island in Rock Island, Illinois, the Confederate Cemetery is the final resting place for nearly 2,000 prisoners of war who died in captivity from disease and the poor living conditions of the camp. The modest cemetery stands in poignant contrast to the Rock Island National Cemetery, a half-mile to the southeast. During the summer of 1863, prison camps in the North were overflowing with Confederate soldiers captured in battle. As a result, Union troops began construction of a new prison camp on an island in the Mississippi River then known as Rock Island, now called Arsenal Island. The camp opened in December 1863 with the arrival of the first prisoners captured at the Battle of Lookout Mountain. The Rock Island Prison Camp was designed to hold more than 10,000 inmates at any one time, and over the final 18 months of the war, more than 12,000 Confederate prisoners passed through its gates. The deplorable conditions at the camp led some to call it the “Andersonville of the North,” a reference to the infamous prison in Georgia. Disease, including smallpox and pneumonia, ran rampant through the prison claiming many lives, while others died from exposure to the elements and the unsanitary conditions of the camp. During the first four months alone, more than 950 Confederate soldiers died. Initially, the dead were buried in a plot located 400 yards south of the prison, but on advice from the prison surgeon, a new cemetery, one that would become Rock Island Confederate Cemetery, was established in 1864, located 1,000 yards southeast of the prison. In March 1864, the remains of 671 Confederate dead were reinterred in the new burial grounds. In all, approximately 1,950 Confederate prisoners were buried in the cemetery, with the last burial occurring on July 11, 1865. All structures related to the prison were transferred to the Rock Island Arsenal and were subsequently demolished, leaving the Confederate Cemetery as the camp’s only remaining feature. The Confederate Cemetery covers a rectangular, three-acre parcel of land, bound by Rodman Avenue and a post-and-chain fence to the north, Confederate Avenue to the south, and heavy tree cover to the east and west. A paved walkway extends from Rodman Avenue to the edge of the burials, passing a six-foot tall obelisk the Daughters of the Confederacy dedicated in 2003 to the Confederate veterans who died at Rock Island. At the south end of the grounds, opposite the monument, is the cemetery’s flagpole. Four Confederate cannons sit near the entrance, two each on either side of the monument. The burial plot is roughly square and consists of 20 rows of graves running north-south. Although the spacing of each row is identical, the beginning and end of the rows are irregular. In 1908, the Commission for Marking the Graves of Confederate Dead began a program to place distinctive pointed-top marble headstones, inscribed with the name and regimental affiliation of each soldier, on the graves. The graves were previously marked with wooden markers and a few private headstones. Rock Island Confederate Cemetery is located on the south side of Rodman Ave., approximately one mile west of the entrance to Arsenal Island, in Rock Island, IL. The cemetery is open for visitation daily from sunrise to sunset. The administrative office is located nearby within the confines of the Rock Island National Cemetery. It is open Monday-Friday from 7:30am to 4:00pm, and is closed on all Federal holidays except for Memorial Day and Veterans Day. For more information, please contact the cemetery office at 309-782-2094, or see the Department of Veterans Affairs website. While visiting, please be mindful that our national cemeteries are hallowed ground. Be respectful to all of our nation’s fallen soldiers and their families. Additional cemetery policies may be posted on site. Visitors to the Rock Island Confederate Cemetery may also be interested in the Rock Island Arsenal. The National Register of Historic Places lists the entire arsenal, while portions of the arsenal are also designated as a National Historic Landmark. Click here for the National Historic Landmark file: text and photographs. Visitors may also take a virtual tour of the island. Also of interest is the Rock Island National Cemetery and the Rock Island Arsenal Museum. Rock Island Confederate Cemetery was photographed to the standards established by the National Park Service’s Historic American Landscapes Survey.